The covert biological attack carried out by the Rajneeshee Cult in Oregon in 1984 which involved the biological agent Salmonella Typhimurium is used to illustrate how the science of forensic epidemiology can be used to differentiate naturally occurring outbreaks from a covert act of bioterrorism. 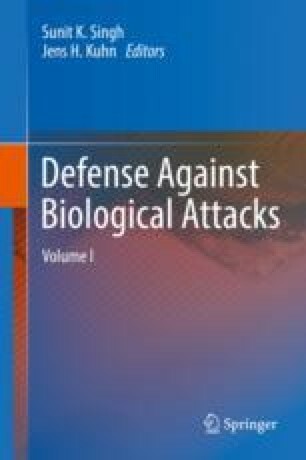 This chapter addresses six objects: first, to examine the changing roles of the health department, epidemiology, and epidemiologists in the investigation of a possible bioterrorism attack; second, to examine the development of the field of forensic epidemiology, the roles and functions of forensic epidemiologists, and the use of the forensic epidemiological approach and joint investigations to examine a possible bioterroristic attack; third, to examine the steps of a standard food outbreak investigation; fourth, to provide historic background information on the Rajneeshee Cult and their motives, agent selection, methods of dispersal, and the outcome of the biological attacks; fifth, to examine the steps used by the public health department to investigate the covert biological attack by the Rajneeshee Cult in 1984; and, finally, to illustrate some of the shortfalls and missed warning signs of the initial investigation and highlight the lessons learned from the attack and how a forensic epidemiologist approach differs from that of an epidemiologist approach as it relates to an investigation into a covert bio-attack that may appear as a naturally occurring outbreak. Mountcastle S. Focus on forensic epidemiology. NC Center for Public Health Preparedness School of Public Health, University of North Carolina, vol 2(5). https://nciph.sph.unc.edu/focus/vol2/issue5/2-5ForensicEpi_issue.pdf. Accessed 25 Nov 2003. Schofield AR. Forensic epidemiology: legal considerations for public health practitioners. Center for Public Health Law Partnerships. www.publichealthlaw.info. Accessed 27 Nov 2003. Centers for Disease Control and Prevention. Salmonella surveillance: annual summary, 2006. 2008. http://www.cdc.gov/ncidod/dbmd/phlisdata/salmonella.htm. Accessed 14 Oct 2008. Centers for Disease Control and Prevention. What is PulseNet? 2006. PulseNet Website. http://www.cdc.gov/pulsenet/whatis.htm. Accessed 3 Dec 2008. Scott MJ. What is a forensics epidemiologist? http://www.chow.com/fact_6174467_forenensic-epidmiologist_html. Accessed 30 Oct 2012. Richards EP. Plagues, police, and posse comitatus: legal issues in forensic epidemiology and public health emergency response. http://biotech.law.lsu.edu. Accessed 2 Aug 2017. Technical Working Group on Crime Scene Investigation, National Institute of Justice. Crime scene investigation: a guide for law enforcement. 2000, January. http://www.ncjrs.org/txtfiles1/nij/178280.txt. Accessed 31 Aug 2005. Answers.com. Rajneesh. http://www.answers.com/topic/rajneesh. Accessed 20 Sept 2006. The New York Times. Former aides to guru in Oregon plead guilty to numerous crimes. http://topics.nytimes.com/top/reference/timestopics/subjects/i/immigration_and_refugees/index.html?query=ONANG,%20DIANNE%20Y&field=per&match=exact. Accessed 20 Sept 2006. Buehler JW, et al. Syndromic surveillance and bioterrorism-related epidemics. Emerg Infect Dis. 2003;9(10). http://www.cdc.gov/ncidod/EID/vol9no10/03-0231.htm. Accessed 15 Oct 2006. Widdowson MA, et al. Automated, laboratory-based system using the Internet for disease outbreak detection, the Netherlands. Emerg Infect Dis. 2003;9(9). http://www.cdc.gov/ncidod/EID/vol9no9/02-0450.htm. Accessed 15 Oct 2006. Stern J. Confronting biological terrorism: global epidemiological monitoring. Harv Int Rev. 2001;23(1). http://hir.harvard.edu/articles/1008/. Accessed 15 Oct 2006. Centers for Disease Control and Prevention. Epidemic intelligence service—about EIS. http://www.cdc.gov/eis/about/about.htm. Accessed 20 Sept 2006. Anderson M. The Rajneeshee Cult-Passagen. http://hem.passagen.se/jan.olofsson/biowarfare/history/rajneeshee.html. Accessed 26 Nov 2005. Pace E. Baghwan Shree Rajneesh, Indian guru, dies at 58. https://www.nytimes.com/1990/01/20/obituaries/baghwan-shree-rajneesh-indian-guru-dies-at-58.html. Accessed 2 Apr 2018. Parker HS. Agricultural bioterrorism: a federal strategy to meet the threat. McNair Paper 65. 2002, March. http://www.au.af.mil/au/awc/awcgate/ndu/mcnair65.pdf. Accessed 26 Nov 2005. Tucker JB. Historical trends related to bioterrorism: an empirical analysis. Emerg Infect Dis. 1999;5(4). http://www.cdc.gov/ncidod/EID/vol5no4/pdf/tucker.pdf. Accessed 26 Nov 2005.